The last autumn and winter storms had caused the planners of the general contractor of the Van Oord Group a lot of trouble. In the Windpark Deutsche Bucht again and again there were delays due to bad weather and too high waves. So that during the installation work the noise level did not exceed the limit of 160 decibels within a radius of 750 meters around the construction site, a multi-level sound insulation concept was used. Including the ‘Double Big Bubble Barrier’. From a wave height of 2 meters, however, working on deck is too dangerous for the crew. In such cases, I leave the decision to my local crew. 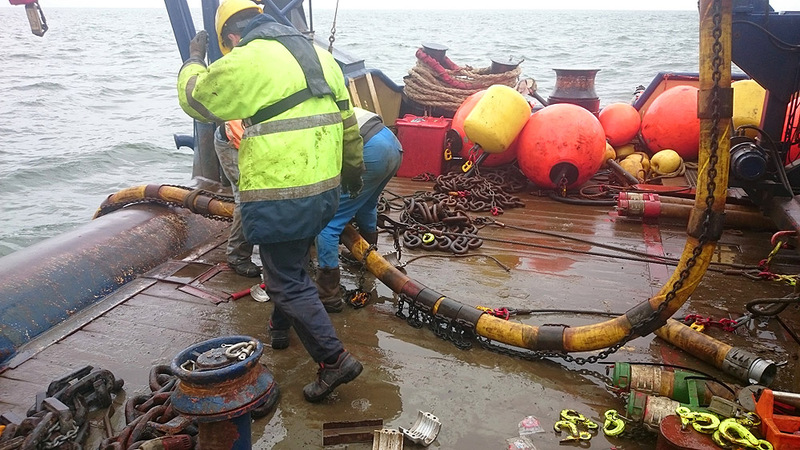 These are all experienced offshore technicians in dealing with the Big Bubble Barrier. They know exactly what is going on and when it will be dangerous. That’s why I do not interfere from my safe and warm office here in Lübeck. 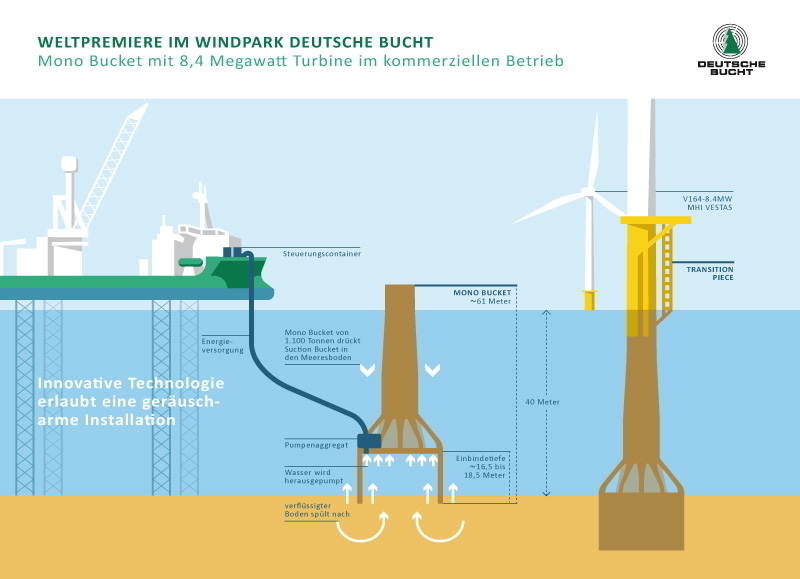 All 31 monopile foundations of Windpark Deutsche Bucht, which had to be rammed, are firmly anchored in the seabed. Actually, the installation of the monopiles should be completed by the end of 2018. But somehow, taking advantage of all the good weather windows, the last foundations were then installed on January 5. With an investment budget of approximately 1.4 billion euros, the Windpark Deutsche Bucht is the third offshore wind project of Northland Power in the North Sea, according to the company. The portfolio of the Canadian energy producer includes the German Windpark Nordsee One (332 MW) and 60 percent of the Dutch Windpark Gemini (600 MW). At a distance of 95 kilometers to the island of Borkum, Windpark Deutsche Bucht is very far away from the German coast. Despite the distance investor Northland Power uses new technology. Two of the MHI Vestas V164-8.4 turbines are being built on Mono Buckets. These foundation structures consist of only one steel cylinder on which a monopile is mounted. They are installed by suction – this allows a low-noise and thus particularly environmentally friendly installation. According to Northern Power, Windpark Deutsche Bucht is the world’s first offshore wind farm to test Mono Buckets as a wind turbine foundation in commercial operation.